Incoming wastewater flows into grit removal tanks. Air is pumped into the bottom and along one side of the tanks, making the water spiral. Heavy particles (grit) are separated from the water by centrifugal force and settle at the bottom of the tank. The grit is regularly collected, backwashed, and disposed of at a sanitary landfill site. From the grit tanks, the wastewater flows through self-cleaning, automatic bar screens. Debris like plastics, rags and sticks captured by the screens is taken to a landfill site for disposal. Suspended solids (sludge) settle at the bottom of the primary tanks and are swept gently to collection hoppers to be pumped away and processed. Surface skimmers remove floating debris (scum). The sludge and scum are pumped to the Biosolids facility for treatment and disposal. The remaining water (effluent) flows by gravity to aeration tanks for secondary treatment. The conventional activated sludge process involves nutrient (phosphorus) removal from the wastewater, aeration using micro-organisms to consume organic matter, and clarification to settle micro-organisms. As the wastewater enters the aeration tank, ferrous chloride is added to remove phosphorous. The ferrous chloride makes the phosphorous in the wastewater settle to the bottom in the final clarifiers. Large, dense populations of bacteria, protozoa, and other micro-organisms consume suspended and dissolved organic matter in the aeration tanks. As the micro-organisms need oxygen to live, air is pumped through diffusers in the base of the tanks. The rising bubbles of air also provide a mixing action, keeping the micro-organisms suspended and in contact with the wastewater. 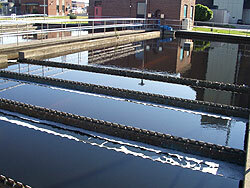 As the population of the micro-organisms constantly increases, excess activated sludge is removed to the sludge thickening facility. The effluent is treated with chlorine to destroy micro-organisms before being discharged into Lake Ontario. The waste activated sludge is pumped into centrifuges, which separate the liquid content of the sludge in a similar way to how the spin cycle of a washing machine removes water from clothes. The thickened sludge is pumped to the blending tanks of the Biosolids facility, where it is mixed with the raw sludge from the primary treatment tanks. Centrate, the liquid removed from the thickened sludge, is recycled back to the primary tanks. There are three anaerobic digesters at Clarkson. Although all three digesters are capable of operating as primary digesters, two of the three normally operate as primary, and the third as a secondary digester. They are connected by a control building containing pumping equipment, gas compressors, boilers, heat exchangers, sludge holding tanks and truck loading facilities. 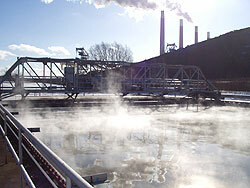 Methane gas produced during the digestion process is used for heating sludge, heating the buildings, and as fuel for generating electricity for the facility. Excess gas is burned at the waste gas flare. 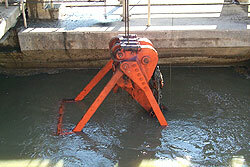 Disposal of sludge is accomplished by one of two methods. Normally, a combination of raw and digested sludge is pumped to the sludge holding tanks and transported by truck to Lakeview Wastewater Treatment Facility for dewatering and incineration. Digested sludge may also be pumped to a temporary storage lagoon on site, where it thickens. The light supernatant is returned to the plant. The final effluent is discharged to Lake Ontario through a pipe reaching 1,250 metres offshore to a diffuser. This structure ensures the effluent is retained for long enough to be thoroughly disinfected. The 35 separate ports in this 188 metre-long pipe discharge the final effluent over a large area to minimalize environmental impact.